Social norms are the informal laws of the society, which are sustained by social sanctions. Some social norms increase the welfare of the society, whereas others may make a significant part of the population worse-off. In India, norms related to the caste system had huge impact on the life of people, and still influence their decisions. Due to the prevalence of the caste system, the occupation of an individual used to be decided by the caste in which he was born. In modern India, caste based discrimination is illegal, nevertheless caste system has not lost its importance. One can easily find the differences in occupational structure and welfare level of upper and lower caste groups. However, the differences in occupational structure can also be found within the upper castes, suggesting that the differences may not be purely the result of caste based discrimination. 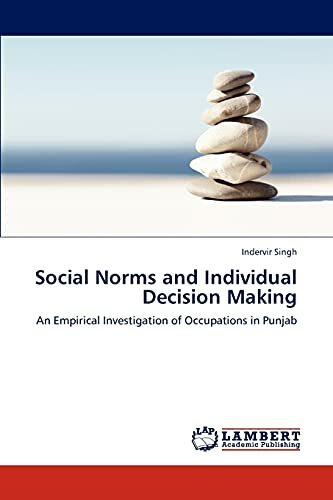 The present study is an attempt to examine the direct and indirect impact of different social norms, related to caste system in India, on occupational choice. Two caste groups, Jat and Bania, are compared for this purpose. The study also examines the impact of social norms on the efficiency of different occupations. Indervir Singh is UGC Junior Research Fellow at Centre for Development Studies, Thiruvananthapuram, Kerala, India. His main research areas of interest are Insitutional Economics, Behavioural Economics, and poverty and inequality. He is currently working on topic 'Law, Social Norms and Contracts'.